GATE 2019 Answer Key – IIT Madras has released the Final Answer Key for GATE 2019 on March 13, 2019. On the basis of the objection submitted by the candidates, the answer key with the necessary correction has been uploaded on the website, gate.iim.ac.in. Candidates can download GATE official Answer Key 2019 for session 1, 2, 3, 4, 5, 6, 7, and 8 from the links below. GATE answer key is released in pdf format. Along with the answer key, the question paper has also been released. Candidates can use both to calculate marks in the exam. Graduate Aptitude Test in Engineering consist of 10 GA questions of 15 marks and 55 questions from the selected subject paper. Check more details on GATE 2019 Answer Key from this page. 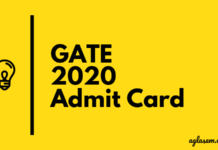 Latest: GATE 2019 Final Answer Key has been released. Download it from the link provided in the table below. Candidates can get GATE 2019 answer key, question paper, and response sheet, for Session 1, 2, 3, 4, 5, 6, 7, and 8 from the link below. 02 Feb 2019 CY Get Here – Available! ME-1 Get Here – Available! MN Get Here – Available! ME-2 Get Here – Available! XE Get Here – Available! XL Get Here – Available! TF Get Here – Available! 03 Feb 2019 CS Get Here – Available! CH Get Here – Available! AE Get Here – Available! AG Get Here – Available! AR Get Here – Available! BT Get Here – Available! EY Get Here – Available! GG Get Here – Available! IN Get Here – Available! MA Get Here – Available! MT Get Here – Available! PE Get Here – Available! PH Get Here – Available! PI Get Here – Available! ST Get Here – Available! 09 Feb 2019 EC Get Here – Available! EE Get Here – Available! 10 Feb 2019 CE-1 Get Here – Available! CE-2 Get Here – Available! Step 1 – Download the answer key for the respective subject paper. Make sure that you download it for correct paper and session. Step 2 – You will also be needing your responses sheet or response. So keep it ready. Step 3 – Start matching answers that you marked in the exam with that given in the answer key. Add 1 or 2 marks, as per the question. Deduct 1/3 marks for the incorrect answer to 1 marks MCQ question. Deduct 2/3 marks for the incorrect answer to 2 marks MCQ question. Formula for Calculation of MCQs = +1 or 2 for Correct Answer – 1/3 or 2/3 for Incorrect Answer. Formula for Calculation of NAT = +1 or 2 for Correct Answer – 0 for Incorrect Answer. General Aptitude (GA): This is a compulsory section, hence, applicable for all the subjects. Here, 15% of the total questions are from Engineering Mathematics. After calculating the score, check GTAE cut off to see if you will get admission in the desired institute or not. It the table above, click on the appropriate link for your subject and session. In will lead to a new page. Scroll a little and you will get the question paper and answer key of GATE 2019 in a table. Tab on the “click here” link and download the answer key or question paper of GATE 2019. 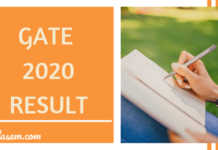 Before the official answer key of GATE 2019, IIT Madras released GATE 2019 Response sheet. Each candidate could only see their response sheet after accessing the GOASP. The response sheet of GATE contained answers marked by the candidate, for each question. IIT Madras allows the candidate to challenge GATE 2019 answer key. This means that if the candidates find that any answer is incorrect or has more than 1 answer option then candidates raise objections. The objection is only considered valid if a document of proof and fee amount is submitted. Document of Proof: It can be an example, formula, scanned image of any chapter, or example, etc. that helps in confirming that the answer option in the GATE 2019 answer key is incorrect. GATE 2019 Challenge Fee Amount: The candidates need to pay Rs. 500 for per challenge. It can only be paid via Net Banking, Debit Card, Credit Card, etc online payment gateway. Access GOAPS by entering enrollment id/e-mail and password. There, select “Correct Answer Key” tab and click on it. Following this, the payment option will open and candidates will have to pay the fee amount. After payment, candidates need to enter question number against which objection is to be submitted. Enter objection and also submit a document of proving with it. Check it all and make the final submit. Evaluation of papers shall be as per the final answer key of GATE 2019. The scheduled date of declaration of result is March 16, 2019. Key highlights of the result announcement are below. The result is announced at GOAPS (GATE 2019 Login) as the scorecard of GATE. Candidates can check result by logging in with enrollment ID and password. Those who obtain cut off marks are declared qualified in GATE 2019 result. Cut off is decided on basis of performance of test takers. Qualifying marks for general category student in each subject are 25 marks (out of 100) or insert symbol + insert symbol, whichever is larger. Here insert symbol is mean and insert symbol is the standard deviation of marks of all candidates who appeared in the paper. Qualified candidates can download score card from March 20, 2019. On basis of the result, candidates can participate in CCMT 2019 that is GATE counselling. Or they can seek PSU recruitment. Public Sector Undertakings (PSU) consider the score of GATE to offer Junior Engineer and other posts. Usually, the normalized score of GATE, which is out of 1000, are considered for recruitment. The application form for PSU Recruitment through GATE release after the announcement of the result, in the month of March. 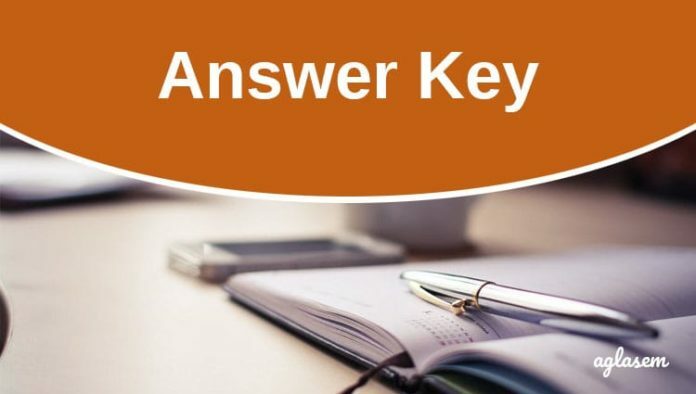 GATE 2019 Answer Key contains correct answers to all questions asked in the exam. As per the final official answer key, the result of GATE 2019 will be announced. Candidates can check question papers, answer keys, solutions of Graduate Aptitude Test in Engineering after the exam from this page.